One of these days, I’m going to write about David Lynch’s use of empty roads to spur uncertainty and dread. A few minutes into “The Return, Part 8,” I thought maybe this was the day. But David Lynch and Mark Frost had other plans. The many shots of a dark, unknowable road littering the episode’s opening serve a purpose, though, and it’s not only to show us the danger ahead—for Ray (George Griffith), for Dark Coop, for anyone whose path they might cross. It’s a signpost to the audience, too: There are swerves ahead. As I mentioned in my review of the Twin Peaks revival’s Showtime premiere, I make it a rule not to discuss the grades I assign to individual episodes. But after tonight’s episode, it feels like a good time to break that rule. If I’d encountered “The Return, Part 8” as a discrete hour-long experimental film, I’m not sure I’d be as impressed with it. (I also try to avoid the first-person in reviews. That’s proven almost impossible with Twin Peaks, in large part because even more than the original series —but very much in keeping with Lynch’s cinematic work—the return hinges on the emotional and visceral reactions it evokes.) But both as a piece of Twin Peaks backstory and as an episode of television, “The Return, Part 8” is as unexpected, as shocking, as thrilling as anything I’ve ever seen. It’s almost a disappointment to see Ray get the upper hand on Dark Coop (if he did, if this apparent ambush wasn’t part of the plan), and that disappointment reveals—to me, at least—something ugly and previously unexamined in myself as a viewer. I loathe Dark Coop. He’s an abomination, a corruption of something good and righteous and dedicated. I want to see him not just defeated, but expunged from this world. But I don’t want someone like Ray to get the best of him. “The Return, Part 8” is cruelly adept at showing us the unexpected, whether it’s on the screen or in the viewers. But not everything is unexpected. You don’t have to be familiar with The Secret History Of Twin Peaks to expect some discussion of nuclear weaponry and its devastating effects in Twin Peaks, around the world, and in the core of our culture. Ever since Gordon Cole’s office, with an enormous poster of a mushroom cloud, was featured in “The Return, Part 4” (and revisited last week), I’ve been expecting the subject to arise, and maybe even to see a glimpse of a mushroom cloud. What I didn’t expect was to zoom right into the heart of Trinity along with the camera. The total effect is cacophony, an illegible collision of images and music and noise. Some of the frames of turmoil show film so scratched, it looks like scribbles; some show bugs swarming in darkness; some show raindrops falling upwards, breaking the simplest of natural laws. But all those images and sounds conspire to create one effect, to inspire one feeling. It’s chaos, manmade chaos colliding with natural chaos. It’s a disharmony we set loose on ourselves, and it can be as big as The Manhattan Project or as small as a mutated creature with bug’s wings and frog’s legs tapping its way out of an eggshell. It’s unleashed by the first nuclear test in White Sands, New Mexico, in 1945, but maybe it could have been released by any act of inhumanity on a grand scale. Either way, it’s an evil capable of looking like us, of talking like us, and of living inside us, of consuming us. None of those ideas or images sum up what they are, and the rest of “The Return, Part 8” explains why. These aren’t creatures from somewhere else, not exactly. These are something we have conjured. They’re not, as the owl imagery of Twin Peaks has sometimes suggested, an evil swooping in from elsewhere. Whatever we call them, they are an evil built on our vilest desires and devices, born into our world in the nuclear firestorm but nurtured by human frailty and cruelty. I admit, I feel a pang of relief at this idea. The original run of Twin Peaks lets Leland Palmer off the hook, explicitly absolving him for Bob’s depredations on his daughter. Leland may not have wanted to give in to Bob’s appetites, but he “invited him in”… and as the diary pages revealed last week remind us, Laura’s trauma is even more devastating for her realization that it was at the hands, if not the intent, of her own father. There’s a grotesque righteousness in the suggestion that the evil of Bob isn’t some external force visited upon humankind, but something born from our corruption, from our willingness to pervert our greatest intellects and abilities to bring about terrible destruction. Ray’s stammered message bears repeating. “It may be the key to what all this is about.” Bob—the evil of Bob, the ability we all harbor to let evil in—has always been an essential element of Twin Peaks. 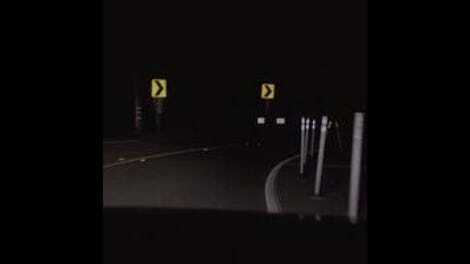 Maybe this is that article I was tempted to write about Lynch and a dark road full of turns, hypnotically dotted with white lines and barely illuminated by headlights. Those roads are more than a device to build suspense. They hint at the blank unknowability of this world we live in, and of all the possible worlds and planes—and especially of the unknowability of humankind, as demonstrated by its willingness to destroy itself and its fellows. 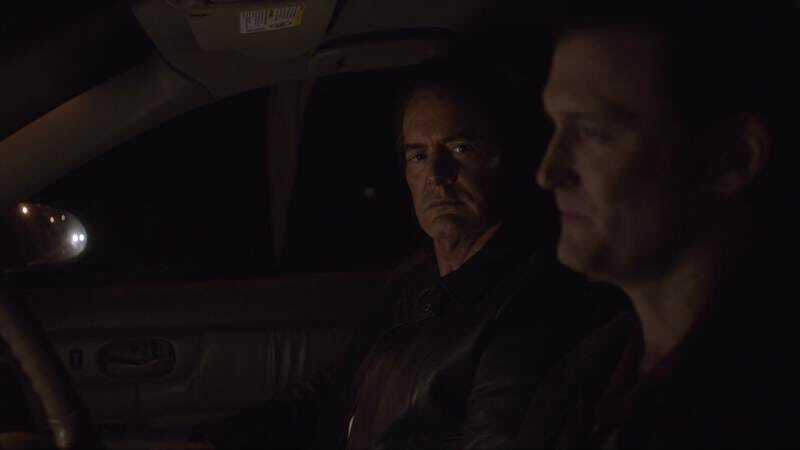 “There are three tracking devices on this car,” Dark Coop tells Ray before tossing his phone, complete with a dummy license number, to set any pursuers off their track, and you can almost hear David Lynch laughing at the appropriateness of that. Last week’s episode was hailed as a return to form, as finally giving the audience the recognizable Twin Peaks they’ve been tuning in for. And now, with a one-week hiatus ahead before “The Return, Part 9,” the show leaves us with this episode to ponder. But now we know where Bob comes from, which is more than I ever expected from Twin Peaks. And we know Laura Palmer, her face gleaming within that golden orb, is on her way to earth, returning to this plane. (Update, an hour later: More precisely, the being who will be Laura Palmer, or will be present in Laura Palmer, is being sent to earth as a counterpoint to Bob. I can only plead, like Dean Pelton, that writing about these unexplained entities, overlapping identities, and intersecting time lines is a tricky task.) Early on in “The Return, Part 8,” before all the unexpected experimental swerves, Ray tells Dark Coop, “We’re heading in the right direction.” The road is hard to see and the terrain is unfamiliar, but this feels like the right direction, all right. It is happening again: In the first season of Twin Peaks, The One-Armed Man says, “I think you say ‘convenience store.’ We lived above it.” In 1945, there is no “above” the (prominently and anachronistically named) convenience store. But there is a small peaked roof, suggesting a tiny second story, on the similar (but not identical) gas station the unnamed young people (Tikaeni Faircrest, Xolo Maridueña) walk past in 1956. Hey, remember when I called the premiere “pure Lynchian horror” unlike anything we’d seen on television? I may have spoken too soon. You know it’s an eventful episode when an appearance by Nine Inch Nails (or as MC J.R. Starr introduces them, “The Nine Inch Nails”) gets relegated to stray observations.